Property Size 1,050 sq. ft. 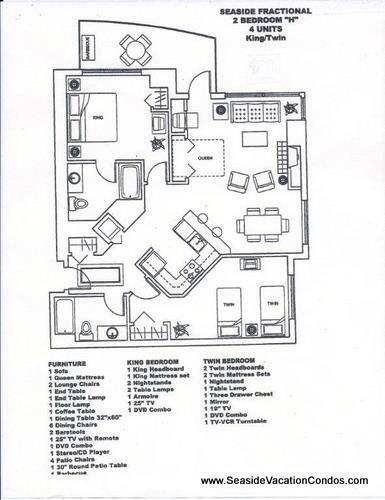 This is a brief description of the two bedroom, two bath, ocean front condos at The Resort. For up to date availability, return to the previous page and go to Search Rentals, input your dates, select Seaside under location, then click Check Availability. The two bedroom, two bath, ocean front condos are located on the NW corner of the building overlooking the Turnaround with spectacular views of the coastline from Tillamook Head to Washington State. They are approximately 1150 sq. ft. and can sleep 6 guests. The units offer a complete kitchen, living and dining room, fireplace, balcony and jetted tub. They are furnished with a king, two twins, and a queen Murphy bed in the living area. The twins may be combined to make a queen size if requested.